Apricot chopped chicken salad over a bed of wild rocket, topped with almonds and a toasted cumin vinaigrette. There aren’t many things that I can remember about the first house I ever lived in. I remember the street number and name. I can’t remember our phone number, but I do remember the number of my best friend at the time. I remember the tarantula my dad brought home that lived in an aquarium in the backyard for a brief time-although that could have been a dream. I remember our dogs, Rodey and Joey and my cat, Sassy that I named after the one from Homeward Bound. Sassy didn’t like me very much – I still have a scar below my left collar bone to prove it. I don’t blame her animosity though because I wasn’t a very good cat mother back then. I accidentally broke her tail and I didn’t understand why she didn’t want to play with me like our dogs did. Five year old Sarah had no business owning a cat. I also remember apricots. My memories from that time are vague, but I do remember the apricot tree in our neighbors yard that we used to collect from. It was the type of tree that you could climb a bit if you wanted to – I could never get high, but even three feet off the ground felt like miles back then. I used to love eating those juicy little stone fruits, but after we moved to our new house I forgot all about them. I don’t think I have had a single apricot since those days. Not until I made this salad that is. I found this recipe a few weeks ago in a magazine and decided that I had to make it. Chopped Chicken with fresh apricots and a toasted cumin vinaigrette – this may look like a simple salad, and in preparation it is, but in flavor it is anything but simple. The saltiness of the chicken paired with the sweetness of the apricots seriously addictive. What really makes this salad special though is the toasted cumin vinaigrette. It’s tangy, aromatic, and fresh all at the same time without ever over powering the salad ingredients. The slivered, toasted almonds add another element of nuttiness while also bringing home the crunch factor for this recipe. If you’re planning on finishing this salad in one sitting go ahead and serve with the cumin vinaigrette mixed in, otherwise I’d recommend storing the salad and the dressing separately so that it keeps longer without going soggy. Soggy salad is sad salad and nobody likes that. Do you have any foods that bring you back to your childhood? Start making the vinaigrette by toasting the cumin seeds in a small frying pan over medium-low heat. Toast for about 3 minutes, stirring frequently until the seeds are golden and fragrant. Transfer to a spice grinder or a mortar and pestle and grind. In a bowl, whisk together the lemon juice, vinegar, honey, cumin, paprika, salt, oil, cilantro, and parsley. Set aside for later. In the same pan that you toasted the cumin, toast the slivered almonds over a medium-low heat for a couple of minutes stirring frequently. 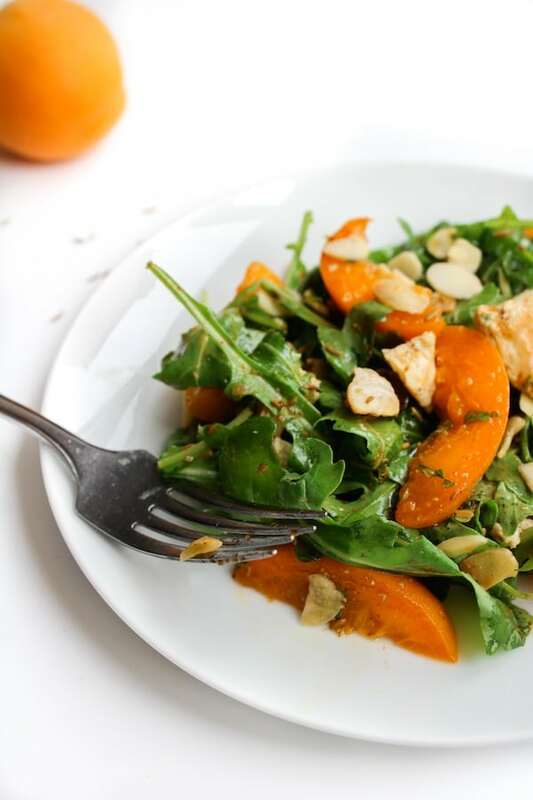 In a large bowl, assemble the salad by tossing together the chicken, apricots, most of the almonds, and the rocket. Drizzle with the vinaigrette and toss gently until the vinaigrette is evenly distributed. Top with the remaining almonds and serve. Recipe lightly adapted from the Aug/Sep edition of the Eating & Living Free From magazine. This sounds really interesting, and it looks great! I love that this salad has a bit of everything – sweet, savoury, spice, and the textures, soft and crunchy, just all add up to what sounds and looks like an amazing meal! I”d eat this all up in one sitting so it’s all in with my dressing!! Thanks, Gabriel! It really does have so much going on with the flavor and texture – easily one of my new favorite salads! Wow!! I wouldn’t have thought of this combination but it looks incredible. I adore the idea of toasting the cumin. Thanks, Vicki! I was surprised at how much I liked the toasted cumin – it made my kitchen smell incredible too which is always a plus! What lovely childhood memories! We had a neighbor, until I was about 5, who had a pear tree in their yard. I had completely forgotten about it. Thanks for reminding me! And the salad looks so fresh and flavorful!